Beautiful Things are Blooming! - Welcome to KFMB! If you - or someone you know - can help, please contact Marilyn at info@kfmb.org or 469-828-9074. The Lend-a-Hand Community Enhancement Initiative helps homeowners who are unable to take care of exterior home repairs due to age, illness, or loss of income and are in threat of code enforcement citations and fines. Want to know more about Lend-a-Hand? Additional info is on our website's Lend-a-Hand page. Pictured (left to right) are: KFMB President Marilyn Lawson, Becky Bertoni, and KTB Executive Director Suzanne Kho. Becky Bertoni received the O.P. Schnabel Senior Citizen Award for demonstrating positive, dynamic, selfless, public-spirited leadership in enhancing the Texas environment during her lifetime. 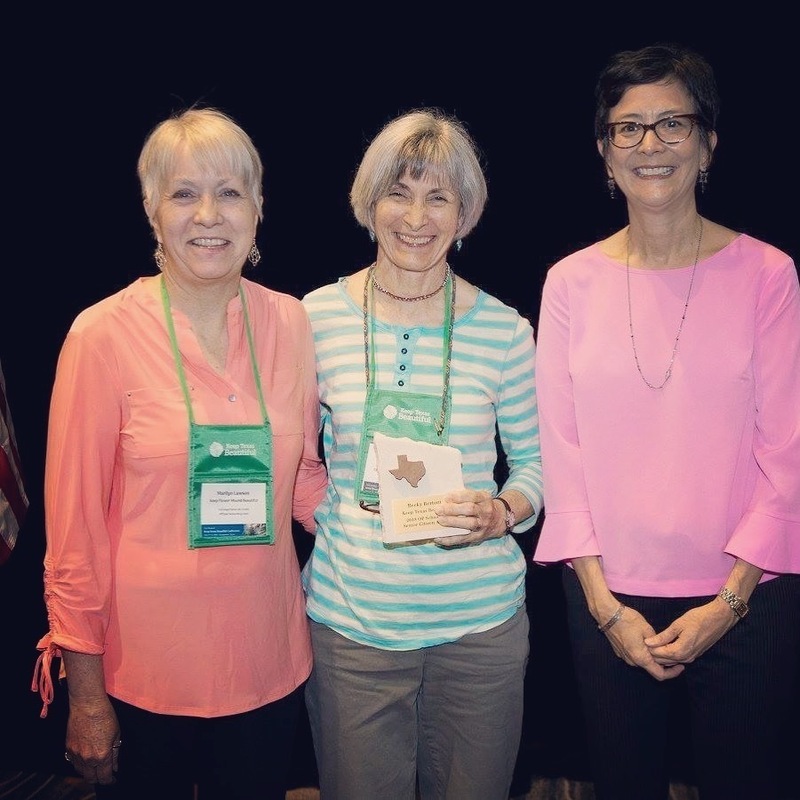 Nominated and recognized by Keep Flower Mound Beautiful (KFMB) for her work at Green Acres, Becky was recently honored at Keep Texas Beautiful’s (KTB) 51st annual conference in Georgetown, Texas. The KTB Awards recognize the efforts of individuals, businesses, media outlets, government agencies, youth, educators, and education organizations that make efforts to enhance their community and protect the Lone Star state. Becky, a Texas Master Naturalist in our area’s Elm Fork Chapter, really represents this year’s conference theme, “Creating Community”. Congratulations, Becky; you’re an awesome ambassador and land steward. We appreciate your work to keep Flower Mound—and Texas—beautiful! KFMB President Marilyn Lawson received the Town of Flower Mound's 2017 Outstanding Citizenship Award. A Flower Mound resident of more than 20 years, Marilyn has tirelessly devoted her time to helping make our Town a beautiful place to live. 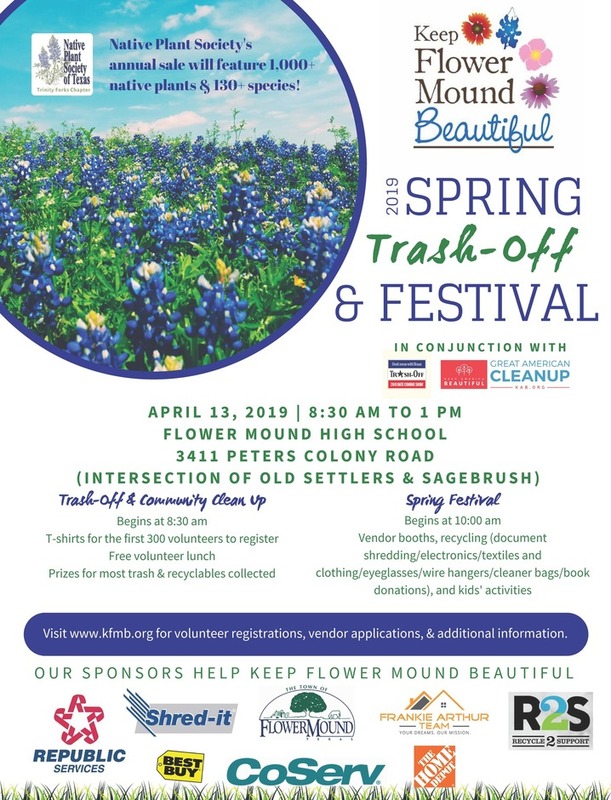 A Keep Flower Mound Beautiful volunteer since 2005, Marilyn has served as President and Treasurer since 2010, organizing numerous community clean-ups, recycling initiatives, and environmental fairs over the years. In 2013, Marilyn founded the Lend-A-Hand program, which helps homeowners who are unable to complete home repairs due to age, illness, or loss of income. She was instrumental in securing the 2017 Governor’s Community Achievement Awards for KFMB, resulting in an upcoming $250,000 landscaping project along a local TxDOT roadway in Flower Mound. 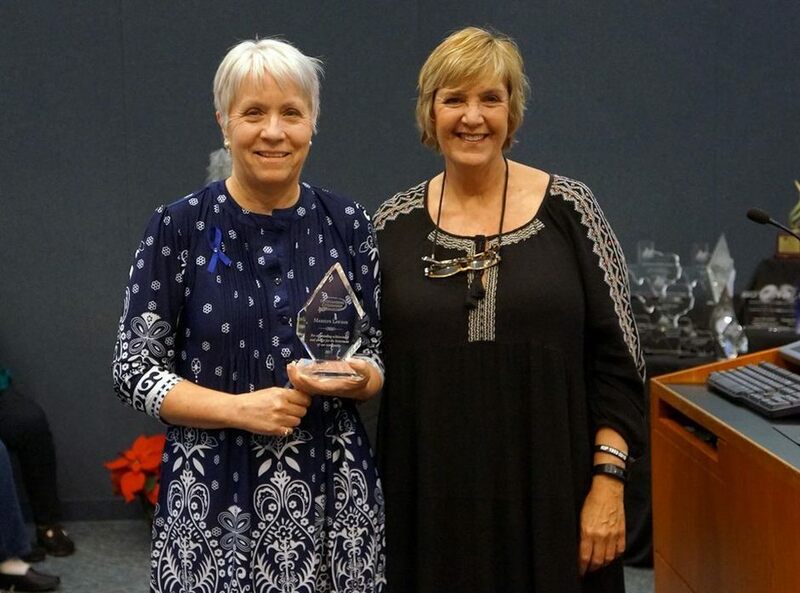 Congratulations, Marilyn, and thank you for all you do to Keep Flower Mound Beautiful! Do you have a passion for our community environment and are willing to get your hands dirty? 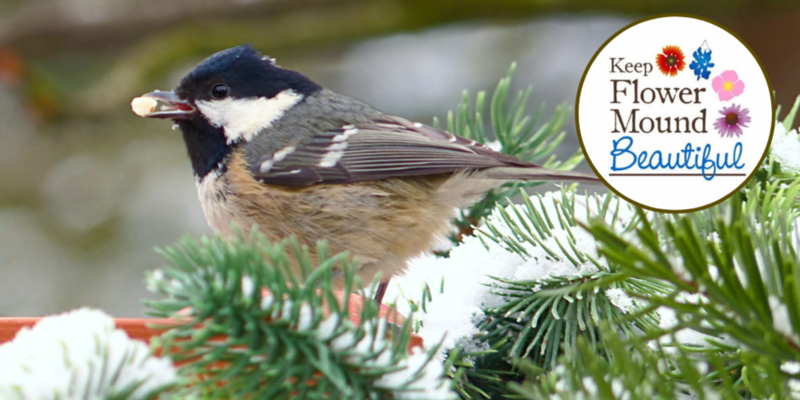 We are a grassroots nonprofit organization that is totally dependent on volunteers. As a board member, you would be required to attend our monthly meetings and participate in our events, especially our large spring and fall cleanup events. Please email or call us if you are interested. AMAZON: Amazon donates 0.5% of your eligible purchase price to the charity of your choice, and Keep Flower Mound Beautiful is on the list. Visit smile.amazon.com, and log in to your regular Amazon account (or create a new one). Type Keep Flower Mound Beautiful in the search bar; select us as your default charitable choice. Thank you for helping to Keep Flower Mound Beautiful! KROGER: Our code is SI870. Online enrollment at www.KrogerCommunityRewards.com. All participants must re-enroll each year (beginning August 1st) to continue earning rewards for their chosen organization. Please note that due to a Kroger system upgrade, the number associated with our Kroger account has changed; SI870 is the new Kroger NPO (Non-Profit Organization) number linked with KFMB. TOM THUMB: Our Good Neighbor number is 12787. Online enrollment is not available, but enrollment may be completed in person at the customer service desk. Your support will help us continue our Lend-a-Hand Community Enhancement Program, helping disabled, senior, or financially challenged Flower Mound residents with outside home maintenance and repairs. Just shop, swipe, and support! KTB's mission is to educate and engage Texans to take responsibility for improving their community environment. KTB does this through programming and education addressing three focus areas: Litter Prevention, Beautification, and Waste Reduction.